If it can be viewed in football terms, the Dak’Art Biennial of African Contemporary Art held in Dakar- the home of the Lions of Teranga, is in the same league with the African Cup of Nations. It is the grandest gathering of visual artists from every corner of the continent and this year’s event that was also the 7th edition was filled with spectacular artworks. The port city of Dakar was turned into one massive visual art exhibition space where artists were bold and blunt in their visually discussion and interrogation of Africa: Agreements, Allusions and Misunderstandings. 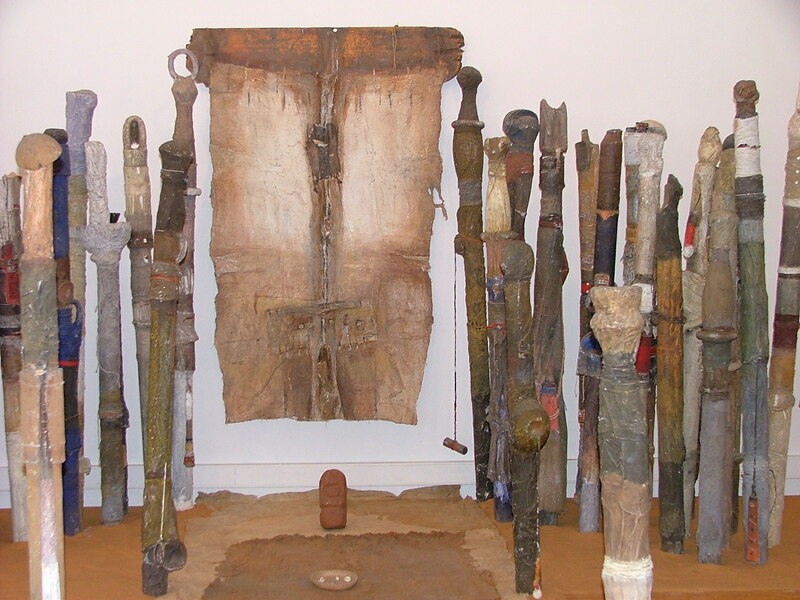 “The artworks gathered in this edition of the Dakar Biennial evoke themes as varied as urbanity and ecology, politics and globalization, spirituality and identity,” noted Yacouba Konate, the Dak’Art 2006 General Curator in an interview. The biennial was dominated by installations and new media art that showed the artists’ ingenious ways to play around with objects to develop impressive pieces. 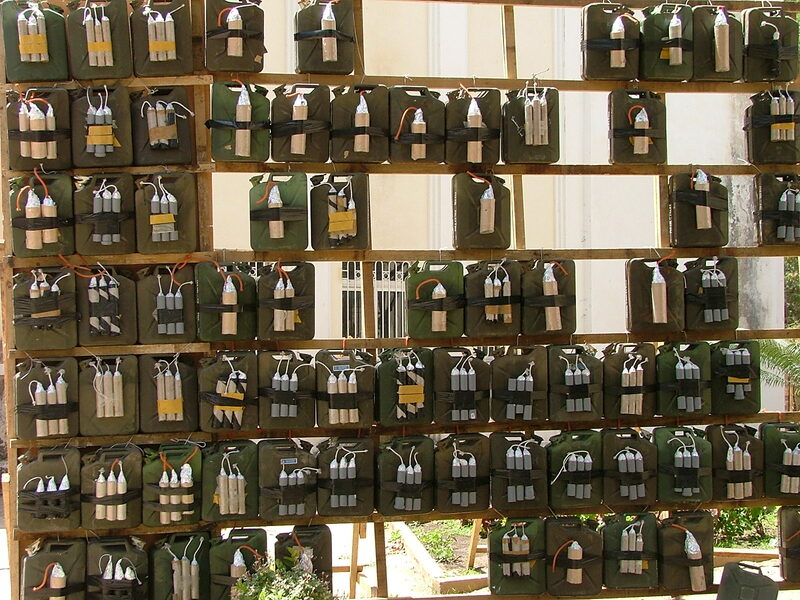 At the opening of the 7th edition of the Biennale, Eni had captured everyone in Dakar including the Senegalese President Abdoulaye Wade, who was the guest of honour, with his installation of bombs often used by the suicide bombers. He had a wonderful performance to accompany his installation and there was no doubt what he was saying about the Middle East. It is not just Eni, who looked at the question of war and peace. Bel Haj Taib from Tunisia had an eye-catching work or art. A fragile multi-media piece, Bel Haj’s sculpture/installation dubbed “Parading for Peace” composed of several tortoises made from soldiers helmets and in a symbolic and yet contradictory postures that leaves you with no doubt that it is a military parade hopefully for piece. Bel Haj Taib from Tunisia- Merchent vers la Paix-----An eye-catching work or art. 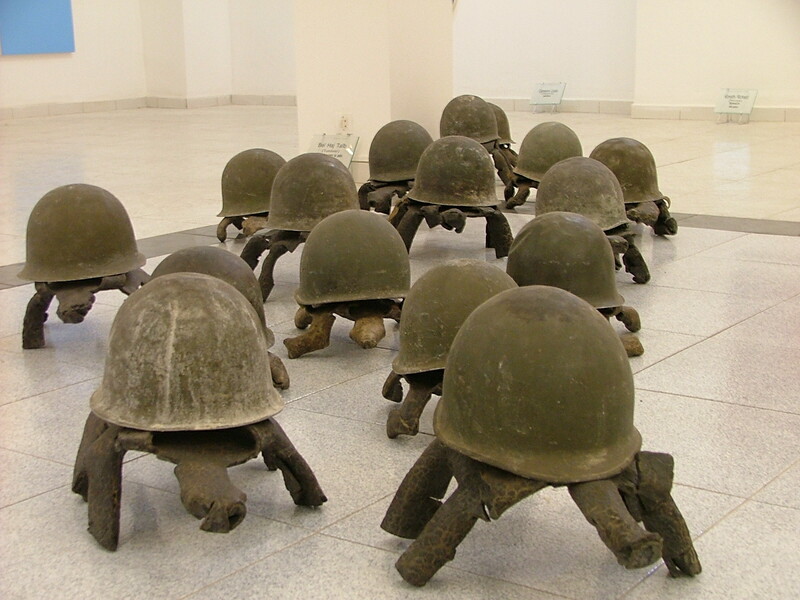 A fragile multi-media piece, Bel Haj’s sculpture/installation dubbed “Parading for Peace” composed of several tortoises made from soldiers helmets and in a symbolic and yet contradictory postures that leaves you with no doubt that it is a military parade hopefully for piece. People waitingg for tthe start of the anticipated flick can ennjoy a variety oof activities before the opening credits begin. Referrals can be an excellent source of new business. interested iin this option, do your homework.